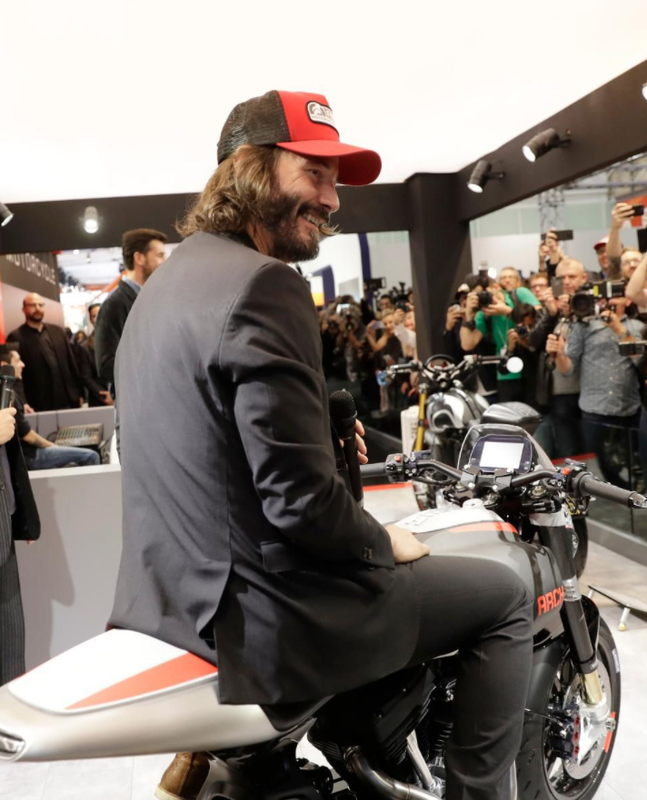 Keanu Reeves is not only a successful Hollywood actor, he's also the co-founder of Arch Motorcycle. Who knew? Well, everyone will know soon when they see Mr. Reeves on the Super Bowl surfing a motorcycle on the open road (as in, actually standing up on it as it races) in support of web-site builder, Squarespace. In this ad, Squarespace chooses to inspire rather than make a rational case for its platform. And it works. The creative is good, but the strategy is better. This ad will get noticed during the Super Bowl because it's visually arresting from the very first frame. Here's a guy standing on his motorcycle as it speeds down a desert road. Hard not to watch after that, particularly with the ultimate recognition of the famous Reeves as the guy. There's a nice "quirky factor" to the execution that Reeves pulls off well reciting the affirmations to the beat and as the camera closes in on him. That said, I doubt it'll register very high on Monday's Super Bowl favorites lists, but I do think the strategy is so strong the ad will still work very hard for Squarespace. The brand could have chosen to rattle off several rational, functional features of the Squarespace web-building platform in an attempt to convince us that, of all the web-building platforms out there, theirs is superior. But they didn't. Instead the brand wisely positions itself as the only web-building platform by rising above the rational weeds and appealing to the "what if" in all of us. Who doesn't have an idea for a service or a product or an event or a cause? Simon Sinek would be proud. Squarespace has found its "Why." Squarespace wants the people who have ideas to make their ideas happen. And now the viewer automatically believes its product is superior without a single bullet point. A web site platform or a form of self-actualization? As the drone shot approaches Reeves on the bike, we hear him reciting affirmations: "The power to do anything you can imagine. It's within you when you discover your real self. Make it happen." Not a bad pep talk right there. The brand ignores the typical web-building-platform purchase funnel and instead appeals to anyone contemplating a business idea. Maybe it's just a germ of an idea, maybe you haven't told anyone yet, maybe you've even started thinking of a name for it. You know, just for fun. Well, this ad closes the entrepreneurial deal by convincing these people they can stop thinking about their ideas and start making their ideas real with a web site. Look at Reeves. He's an actor but started a motorcycle business on the side because he likes motorcycles. He followed his passion, now you follow yours. Had the ad led with superior web-building features it would have lost all of these potential entrepreneurs. They weren't ready for that level of detail yet and, so, would have completely tuned out. But simply linking a person's unrealized ambitions to a tangible method of making those ambitions happen? Now they're listening. Along the way, the brand makes it clear that it's no longer in the business of "web sites" and is now in the business of "self-actualization." That's a big difference and an even bigger brand platform to build upon for years to come. Will the ad win any accolades on Monday after the game? Maybe, but I wouldn't bet on it. Will it win customers? That's a much safer bet.